Exciting news! 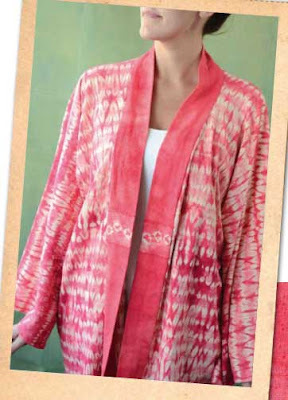 Two of my shibori artwear pieces will be featured in an article in the Summer 2011 Belle Armoire magazine. My shibori bog jacket in Belle Armoire, July 2011. Shown here is my silk noil Bog Jacket, and the other garment included is my Power of Panthera Leo vest that won Best of Show in the Riberbend Fiber Arts 2010 Challenge. The article, called "Compliments of the Dye Pot," shows full views and detail photos of both garments, talks about their inspiration, and provides information on the shibori patterns and dye process. To pre-order this issue with a special Free Shipping offer, click here. Hurry, the offer expires May 25.
woohoo, Veronica!! I am already anxiously awaiting the arrival of my magazine, but now will be even more delighted to see your art work in it. I'm excited, too. I already have the magazine pre-ordered.